Sunday I was in the mood for some chocolate. I asked my daughter if she wanted to help me make brownies or cookies. She told me, "Brownies. Dinosaur Brownies!" Dinosaur Brownies??? I don't know where she came up with that. I thought that maybe if we had a dinosaur cookie cutter then we could make dinosaur brownie cut outs--but we don't. They're super simple to make. Here's how I did it . . .
After cooking your brownies let them cool and cut a slice. 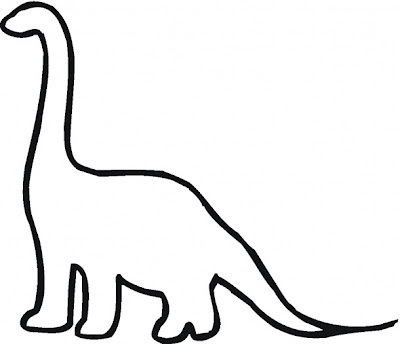 I found this outline of a dinosaur here. I printed and cut it out. I then placed the cut out dino on top of the brownie . . .
And after sprinkling on a little powdered sugar through a sieve remove the dino pattern and you have one yummy dino brownie. My daughter was thrilled with her dinosaur brownie. I asked her if she liked it and she said, "Yes. I want a dinosaur on my brownie everyday." A brownie everyday??? Sounds good to me! You are so creative! I love that you figured out a way to make a dino brownie for her! WOW, what a fun blog! Really, I have been scrolling and reading and I feel like ANY of these are things I would actually do with my boys. Just quick, low preparation, fun activities to keep things a little more exciting for stay at home moms and kids. I love it! Thanks so much for creating this blog! It's wonderful. I'm new to your blog and think that it is great! My mom use to make Dinosaur Feet for us. Simply put, mix but a choc cake mix and cook them on the waffle iron. You can then cut them out to look like a foot print, or leave them as is. Then we frosted them. TASTY and EASY!